If a family vacation includes your 4 legged friends where they have as much fun as you, then Grey Fox is perfect for you! 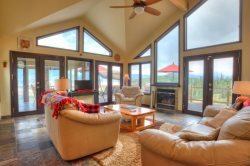 This amazing mountain retreat in Summit Cove in Dillon is only 2 miles from Keystone and within 15 minutes of 4 other amazing ski mountains. The 3000 square foot home is furnished with luxurious interiors, spacious bedrooms and a fenced-in backyard on one-half acre. The fenced yard is perfect for your furry friend to run free while you enjoy the rest of your time! The beautiful rustic toned interiors have new leather furniture and comfortable beds! The open floor plan is perfect for entertaining as the kitchen flows seamlessly into the formal dining room and into the living room. Out the sliding door of the kitchen, you will be led to the backyard where you will find your own private and custom Arctic Spa Hot Tub that comfortably seats 6-8 people. Not only can you use the hot tub, but you have full access to the outdoor grill! And when it’s time to hit the mountain, your car will be waiting for you in the private 2 car garage, so no need to spend extra time heating up the car before you start your adventure. Also included in the unit is WiFi, cable, board games, and a top loading washer and front loading dryer. Make sure to snag this property before it’s gone as pet-friendly units are hard to come by! An inflatable Queen-sized mattress is available in the house. A Pack-n-Play is also available.